China is set to build a hotel shaped like an upside-down ping-pong paddle as part of a new $45.8 million sports complex. 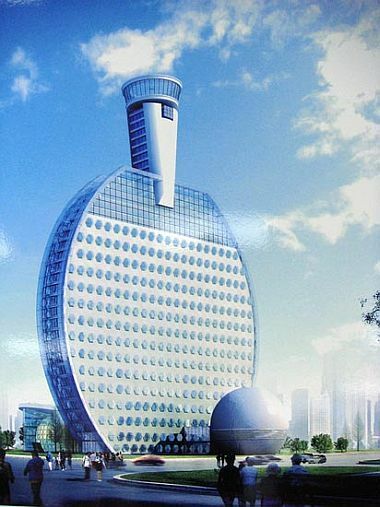 "An erected ping-pong racket has a perfect architectural shape for a hotel," Jin Chang, director with Huainan Municipal Bureau of Sports, tells the news outlet. 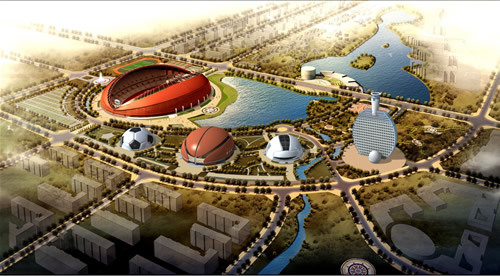 But the ping-pong racket hotel isn't the only oddly shaped building in the works for the 165-acre sporting complex: there will also be a main stadium shaped like an American football, plus smaller stadiums and gym facilities shaped like a volleyball, soccer ball, and basketball. The sports bureau has signed an agreement with China Sports Industry Group that guarantees various sports games will be held in the stadiums over the next 20 years. This is not the first time hotel designers have turned to sports for inspiration. The Jumeirah Beach Hotel in Dubai is designed as a wave to compliment the sail-shaped Burj al Arab, one of Dubai's most iconic images. In France, the Rugby World Cup was celebrated with the construction of a giant rugby ball hotel in 2007. During the event, rooms cost nearly $10,000 per night.